All You Need To Know For The Rose Hips Benefits And Home Remedies! The unique combination of vitamin C and other ingredients in the fruits of wild rose stimulates the formation of red blood cells, increases efficiency and enhances the body’s resistance. It is recommended in patients with diabetes, anemia, mental and physical fatigue, colds, avitaminosis. In traditional folk medicine, it is used to enhance the immune system, particularly in late autumn, winter and early spring. It is believed that wild rose is useful mainly to strengthen the heart and circulatory system .Because of pectin and tannins folk medicine it is also used for gastrointestinal and bronchial diseases. Besides that it successfully fights infection, wild rose promotes mental performance and protects joints from arthritic diseases. How to make a tincture of rose hips? 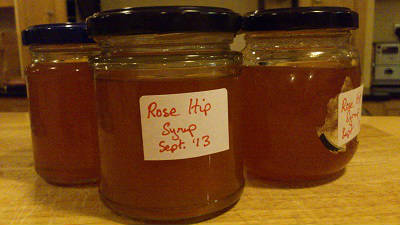 Add 1 tablespoon rosehips in a cup of boiling water in enameled or glass container. Place the container in a water bath for 10 minutes. Then leave for about 10-12 hours, strain it and drink it throughout the day. To make hip tincture more palatable and to become even more useful feature, you can add honey and some dried fruits. Infusion of rose hips in a thermos contains more ascorbic acid and vitamin P. Hips are flooded with water, boiled in the same proportion; thermos should be closed and held for 10-12 hours. • Tincture of rose hips contain a large amount of acid is not recommended in stomach diseases with high acidity. • After each administration of tincture of rose hips it is recommended to rinse the mouth with water to avoid damaging the enamel of the teeth. • Rose hip increased bleeding, so it should not be taken for heart failure. 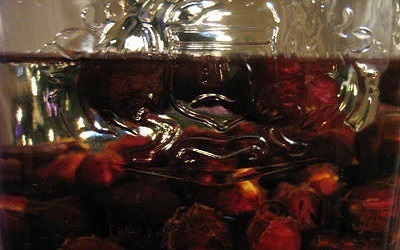 Put the rose hips in water and boil them. When they are boiled, leave simmering for half an hour,. Don’t forget that you should mash them periodically with a fork to release all their goodness, and topping up the water. After this, drain it through a sieve lined with muslin and squeeze out all the juice. Now add sugar to this juice but heat it again to dissolve it. At the end add citric acid.